Thread: Jelly rolls, what are they good for? I've never used a 2.5 inch strip for anything but binding. Which type of quilt are they used in? There are hundreds of quilt patterns for Jelly rolls. 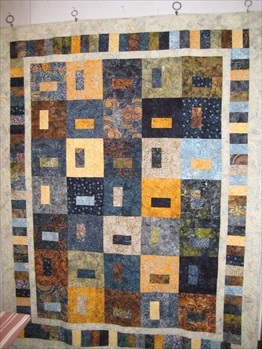 I've made several quilts with jelly rolls - my avatar is most recent with a jelly roll. Lots of patterns and lots of books featuring jelly rolls - they give you an opportunity to use a fabric line without buying a lot of yardage. You probably still would need to add a background fabric to make the line pop. Gives a person the opportunity to try quilting without cutting much! Have you noticed how many quilts in Keepsake Quilting use 2 1/2 in strips? I love the 2-1/2" strip size. I use it for sashing, making all kinds of blocks, and of course binding. If I find a jelly roll set I like I will get several alike if they are on sale. Otherwise I cut my own. 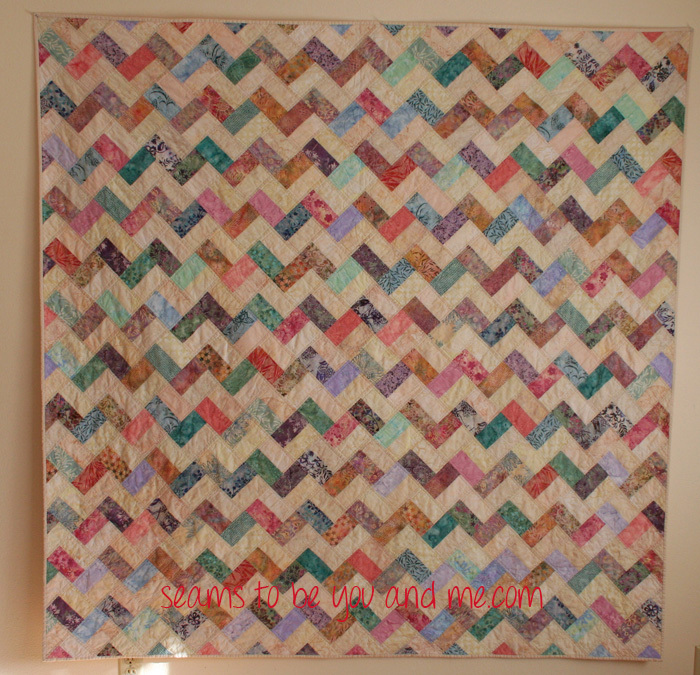 if you don't like that one, you can cut it up and make a postage stamp quilt. They're great to have on hand when you suddenly find yourself invited to a baby shower - you can put together a baby quilt in less than a morning using jelly roll strips. I just finished a quilt that was all half square triangles and flying geese and were all done from jelly rolls that were subcut into squares and rectangles. If you are doing something like this, it is great for saving you a lot of cutting. 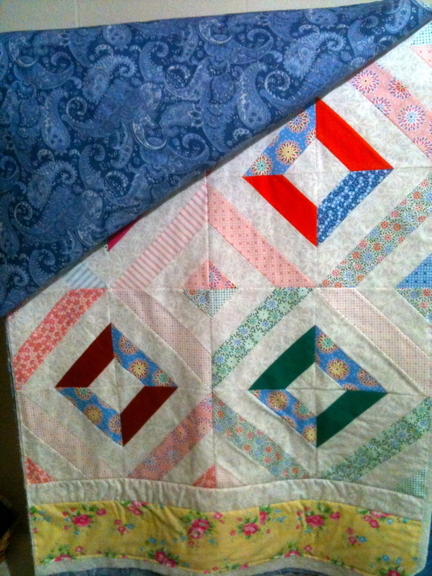 These are a few of the quilts I have made with jelly rolls. I love using them. 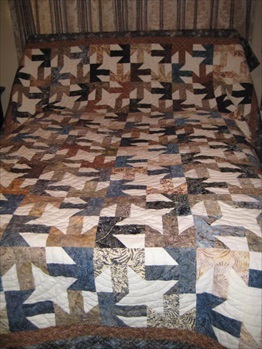 Strip quilts. 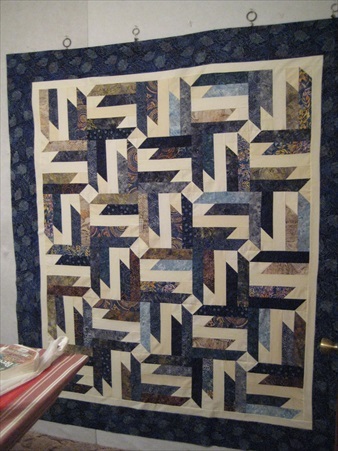 Bonnie Hunt has lots of tutorials in regards to strip quilts. You can also go to Jenny Doan at MISSOURI STAR QUILT COMPANY. She has lots of tutorials for JELLY ROLLS. there are dozens of jelly roll quilts books on the market with many many patterns. Here is my latest one. 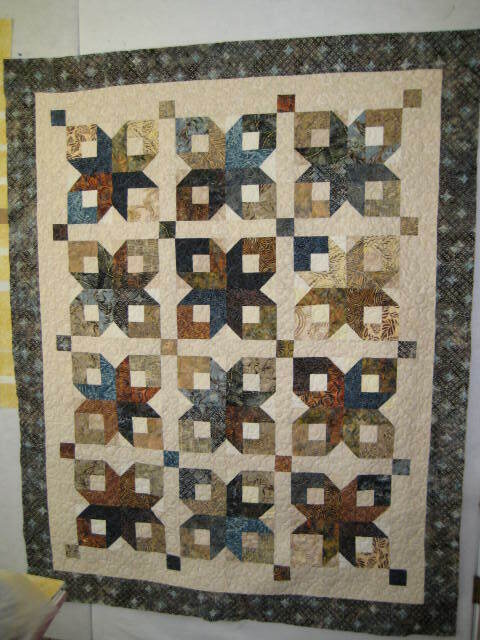 Used the strips from Missouri Quilt and handquilted it. The pattern was in the new Quilting Quickly magazine. Saw the pattern and went to my stash!!! Sandybeach, those are lovely. I really like the first and fourth! 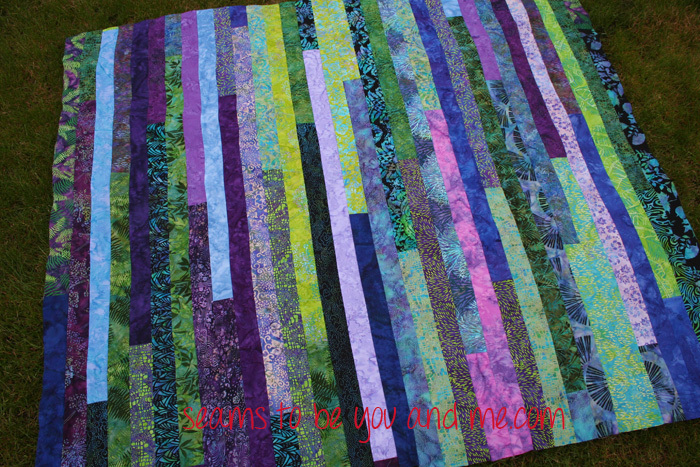 You too, QuiltingHaven...love your colors. Nicely done ladies! What a great lot of inspiration in all those gorgeous quilts. Oh, and someone posted this week a beautiful Summer In The Park that would work well with jelly rolls. Last edited by sparkys_mom; 06-19-2013 at 03:42 AM. Who can resist buying a fabulous jelly roll. I love them in baskets sitting in my sewing room. Great decor even if you don't use them. One really great advantage of jelly rolls is the variety of matching colors. The maker does all the work for you of finding 40 different colors. It makes my head hurt just thinking about chosing 40 colors. That is is you can find 40 colors with out driving all over the area! ( but what fun that would be). I used a jelly roll of brights pinks/green and would never have thought of putting all those colors/patterns together (if I could have found them). .Alos consider cost. 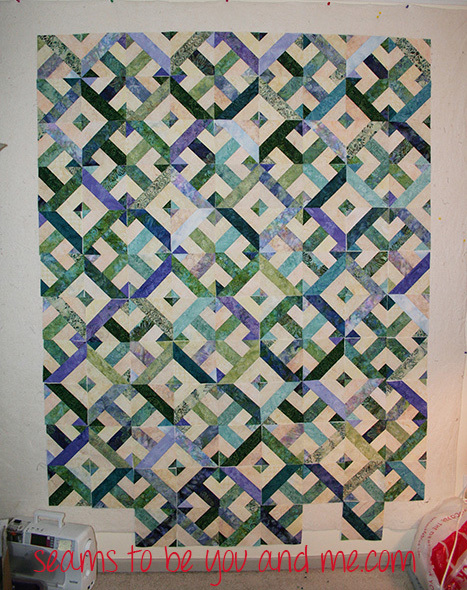 I feel bad asking for 1/4yr cut but even that may be too much for making some type of strip quilt. Jelly rolls are very cost effective! 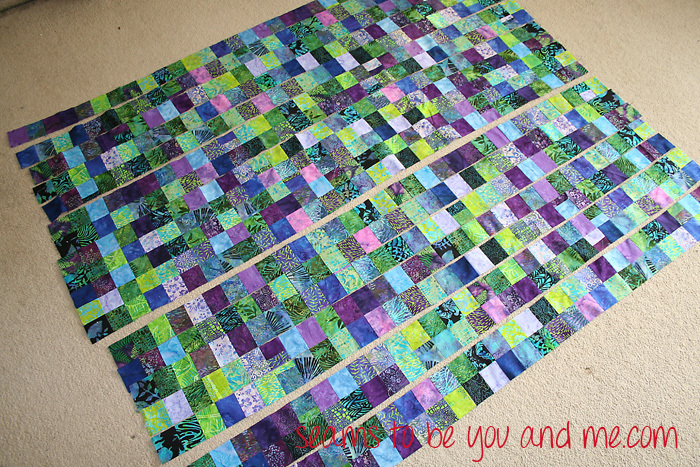 It is so much fun to use a jelly roll for a simple quilt. I like to do something that I can complete in a short time and these provide that opportunity. No matter what you do with them, they turn out lovely. Try it, you will love it! I use 2 1/2" strips a lot, but refuse to pay the price for jelly rolls. Yes, I have bought 3 jelly rolls but found that when I figured out the yardage the price was far more than if I had cut my own strips. I won't buy any more precuts unless they are on sale so I don't pay any more than the price per yard. Oh, and I hate the pinked edge on precuts as it makes it hard to get a consistent finished size. I agree, way too many to try and name them all. They come in such a variety of fabrics and colors and they are pre-cut for you. When I was at Eleanor Burns California store, I mentioned to a clerk that she had not come out with a book for jelly rolls, they were a couple of years old by then. The clerk said generally you can use them in most patterns. I found one of El's books and sure enough made a beautiful quilt. I think the best thing about them other than being pre-cut for you is that you get such a good variety of fabric. I generally ask if there are 40 different fabrics as some local quilt stores will put in duplicates of an ugly fabric (sorry, all you owners out there, but it has happened 3x now to me). I really like all the precuts out there.